Little Gavin is here! 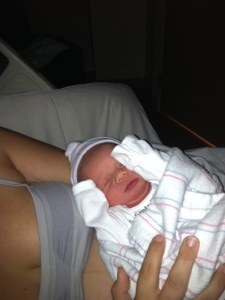 Born 10/22/12 at 9:58pm. 7 lbs. 19.75 in long. We are doing great! Will fill you in on the whole story in a few days! How wonderful! Congratulations to you and your family. Eeeeeeeeee! Congratulations, and welcome to the world little Gavin! Congratulations to you and your family. Looking forward to lots of photos when you start cooking again. Gavin is a WONDERFUL name and he is a BEAUTIFUL baby!! I forget how wonderfully awesome those newborns actually are until I see another newborn photo. Amazing. Congratulations to all four of you — and I hope you personally are feeling well on this side of the birth ;-).